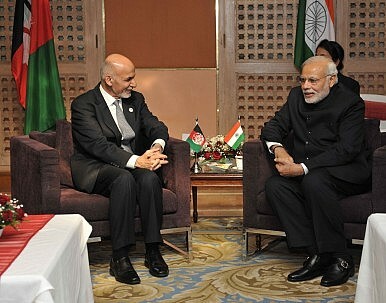 Prime Minister Narendra Modi of India meets President Ashraf Ghani of Afghanistan on the sidelines of 18th SAARC Summit at Kathmandu (November 26, 2014). A Turning Point in Afghanistan-India Relations? Recent developments in the India-Afghanistan bilateral relationship suggest a major shift may be afoot. Ever since a U.S.-brokered agreement resolved Afghanistan’s electoral dispute last year, forming an experimental National Unity Government, strategic relations between Afghanistan and India have effectively been stuck in limbo. The primary cause for this was Afghan President Ashraf Ghani’s pollyannaish attempt to forge a modus vivendi with Pakistan – a break from his predecessor Hamid Karzai who, despite his mistrust of the United States in his final years at the helm, approached India with ease. Afghanistan’s rapprochement with Pakistan was short-lived, confirming the expectations of many who suspected that Ghani would be unable to keep at bay the interests in Pakistan that have historically sought to sow instability and violence in Afghanistan. The first troubling signs were that Pakistani Prime Minister Nawaz Sharif and Ghani managed to agree to a formal counter-terrorism cooperation mechanism that would see Afghanistan’s National Directorate of Security liaise with Pakistan’s Inter-Services Intelligence. Ghani’s first mistake was trusting Pakistan’s civilian leadership to speak on behalf of the country’s military-intelligence apparatus. As has been the case throughout most of Pakistan’s history, foreign and security assurances delivered by civilian leaders are subject to the fickle whims of the country’s military establishment. To credit Ghani, the arrangement with Pakistan was never entirely comfortable. Critical voices in Afghanistan cried foul when the arrangement for counter-terrorism cooperation was announced, but it was an attempt by the new government in Afghanistan to seek peace. After all, peace talks with the Taliban would be dead-on-arrival without Pakistan’s support. To make matters worse, the August attacks came weeks after the Taliban publicly revealed that Mullah Mohammed Omar, the group’s supreme leader and Amir al-Mumineen (Commander of the Faithful), had been dead for two years. The news sparked a short-lived succession crisis, which temporarily raised the question of whether Omar’s successor was beholden to Pakistan’s intelligence apparatus in the same way that Omar had been. Ultimately, Mullah Mohammed Akhtar Mansoor, Omar’s erstwhile second-in-command, prevailed. Mansoor had been pulling the strings and issuing orders in Omar’s name for two years and carried forward the Taliban’s cooperation with Pakistan. Following these developments, the Pakistan-backed peace talks with the Taliban, which were sponsored by both China and the United States, have stalled. Additionally, the fall of Kunduz, Afghanistan’s fifth largest city, in late-September emphasized the Taliban’s reversion to bold and ambitious insurgency, determined to seize territorial control of strategic nodes of Afghan territory. Ghani’s misguided attempt to forge a workable relationship with Pakistan cost India and Afghanistan a “lost year” that could have otherwise seen real strategic progress. In May 2014, Narendra Modi was elected with a bold vision for India’s neighborhood diplomacy. While economic and cultural interactions between Kabul and New Delhi continued, Afghanistan lost interest in acquiring Indian arms. After all, any serious attempt at engagement with Pakistan would necessitate a freeze in strategic and military rapprochement with India. For Pakistan, Afghanistan is a zero-sum game with India. Earlier this month, Ghani delivered the clearest signal yet that his brief and ill-fated experiment with Pakistan was over. In early November, reports suggested that Kabul would formally request four attack helicopters from India to bolster the capabilities of the Afghan National Army against Taliban militants. Afghan National Security Adviser Mohammad Hanif Atmar and Afghan Deputy Foreign Minister Hekmat Khalil Karzai arrived in New Delhi shortly thereafter to finalize the deal. Over the weekend, Indian reports confirmed that four Russian Mi-25 attack helicopters will be transfered from the Indian Air Force to Afghanistan. The delivery will come as soon as January 2016. Karzai, the former Afghan president’s cousin, said that the visit had the overarching objective of “operationalizing” the 2011 India-Afghanistan Strategic Partnership Agreement. For Indian Prime Minister Narendra Modi’s government, the deal demonstrates a willingness to take India’s policy toward Afghanistan beyond the limits that had prevailed during the previous government’s era. Under the United Progressive Alliance-led coalition government, India had approved support and training activities for the Afghan army and security forces, but had stopped short of providing lethal support. The closest it got was a May 2014 deal with Russia to finance military equipment, including artillery, tanks, and armored vehicles, that would be delivered to Afghanistan. In late April 2015, just before Kabul announced its counter-terrorism cooperation arrangement with Pakistan, India transfered three light utility, multi-role helicopters. The transfer of three Mi-25 attack helicopters won’t be a game-changer by any means, either for Afghanistan’s fight against the Taliban or for its relationship with India in the short-term. What it does suggest is the Ghani government is close to picking up the Karzai approach to Afghanistan’s bilateral relationship with India. The latter part of the statement, parsed in the context of India’s restrained approach toward Pakistan, applies less to the current government in New Delhi. As I’ve noted elsewhere, Modi’s own attempt at pursuing constructive dialogue with Nawaz Sharif has fallen flat, taking South Asia’s most important and bitter bilateral back to square one. For India and Afghanistan, for the first time in recent memory – and certainly for the first time since both Modi and Ghani have been in charge – there is a sense that the door for expanded strategic and military cooperation is open. What is still unknown is if New Delhi and Kabul are willing to expand their cooperation independent of their respective relationships with Islamabad. These developments have consequences for the United States as well. After the fall of Kunduz, Washington has reconsidered its timetable for complete withdrawal from Afghanistan. If the transfer of lethal equipment from India to Afghanistan becomes a habit, the United States should be supportive. Additionally, though the United States’ track record is shaky on this front, Washington can seek to keep Pakistan’s military in line with deftly structured incentives. For instance, the U.S. Department of Defense has somewhat realigned the Pakistani military’s domestic counterinsurgency efforts with a credible threat to withhold certification that it has adequately focused its efforts on the Haqqani network, thereby threatening a $300 million Coalition Support Fund (CSF) reimbursement tranche. Pakistan’s chief of army staff, General Raheel Sharif, arguably the most influential man in the country when it comes to driving its foreign and security, spent the past week in the United States, discussing Afghanistan and other issues with U.S. officials. With reports just weeks before his arrival in Washington that India would transfer attack helicopters to Afghanistan, it is not unlikely that the issue came up during his meetings with U.S. officials ranging from Secretary of State John Kerry, Secretary of Defense Ashton Carter, Vice President Joe Biden, CIA Director John Brennan, Army Chief of Staff General Mark Milley, and his effective counterpart in the U.S. military, General Joseph Dunford, the chairman of the joint chiefs of staff. After the brief fall of Kunduz, the future of Afghan security, particularly in the country’s hinterlands, has come under question. India can no doubt play a much greater role as a net provider of security in the country, but both countries will need to seize the opportunity that exists today. A sensible move for the Indian government now, to demonstrate that it is serious about maintaining momentum in the bilateral, would be for the prime minister to visit Kabul. Fortunately, this appears to be in the works. The India-Afghanistan bilateral will be one to watch in 2016. Ankit Panda is an associate editor at The Diplomat. On a Tightrope: Can Afghanistan Balance Between Pakistan and India? Afghanistan is in a difficult position today. Can it walk a tightrope between India and Pakistan?